Pet Paintings from your photos by Jeanna Nelis. 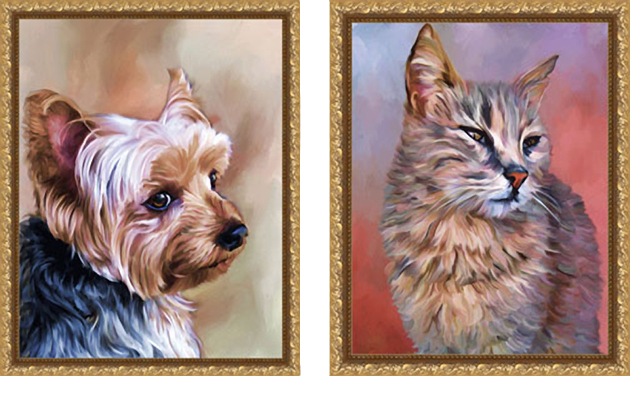 Pet paintings created from your most cherished photos of your most cherished pet. Each pet painting is developed stroke by stroke to give life to the pet painting and depict your loved pet's personality. Pet paintings are easy to order, just send me a photo by email or snail mail. You will have a choice of the current background in the photo or I can replace it with an traditional abstract background. A proof will be sent to you via email for your approval. Minor changes can be made. Please see the FAQ's page for more information. Please see samples of my pet paintings. Please click on the link below to view a demonstration of a painting.